Can you guess which person picked which painting? 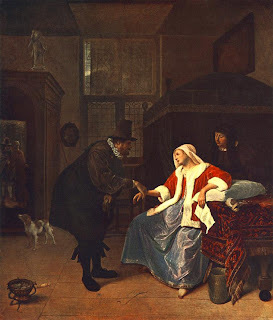 During the 1660s, Steen painted several scenes of doctors paying house calls to visit female patients. As in this painting, Steen’s doctors usually do not recognize the cause of the female’s ailing health – love sickness. In some of Steen’s paintings that follow this theme, he also includes the phrase, “Here a physician is of no avail, since it is love sickness.” 1 I picked this card for J (yep, it was me!) because I literally got sick to my stomach when J returned home after a study abroad. We were close to getting engaged at that point; my doctor said I experienced too much “positive estress” with J’s return, which led to an excess of acid in my stomach. Now we joke that J gives me ulcers. 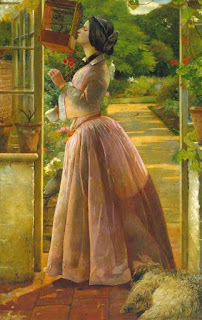 In this painting, it appears that this woman is estranged from her lover, as indicated by the letter in her hand. It wasn’t until after I sent J this painting that I realized it is especially appropriate for us today. Chagall’s painting has a rather melancholy tone, since the woman is dressed in black clothes (perhaps funeral attire). 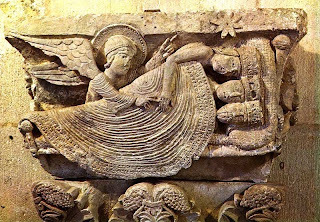 It is thought by some that the woman is celebrating the birthday of a deceased lover; he floats above the woman and contorts his body so that he can give her a kiss. Although I suppose this seems like a morbid painting to send as an anniversary card, it is fitting in the sense that J and I are apart on our special day. Actually, the sentiment that J included with this card (did you guess that he’d pick a 20th century artist?!?) was quite fitting and lovely. 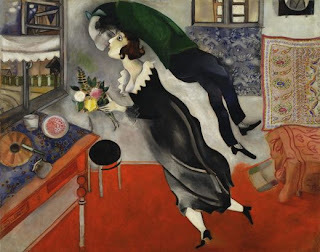 J also pointed out that Chagall’s floating figure is similar (in its awkward positioning and floating-ness) to some paintings by Brian Kershisnik. I don’t know why I didn’t notice that before: Kershisnik’s work is a little Chagallian, don’t you think? 1 Lyckle de Vries. “Steen, Jan.” In Grove Art Online. 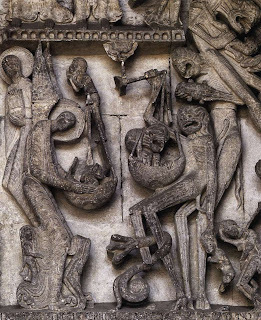 Oxford Art Online, found online at http://www.oxfordartonline.com.erl.lib.byu.edu/subscriber/article/grove/art/T081140, accessed December 31, 2008. J just got an email from the Josef Albers Foundation. Apparently, the foundation is busy making a catalogue raisonne of all of the paintings by Albers. It looks like our Homage to the Square project won’t come to fruition, since the foundation is unlikely to sponsor or help with an additional project of a similar nature.